Two things are on tap for today, either you still have the day off to lounge around and treat your hangover & overstuffed tummy right, or you’re back in the office. I’m one of the latter, so right now I’m basically staving off being resentful of capitalism. This episode will get me through it. Come on, a new song from Johnny Socko, a great brand new song from the Dendrites and a song that will be out in a few weeks from Be Like Max! To top it off there’s even Sammy Kay reminding us to keep a Positive Mental Attitude, so I guess things COULD be worse and I need to lighten up. Sometimes I need the music to remind me not to be such a stick in the mud. When building yourself up, don’t forget to keep part of yourself to yourself. Your ego is only scaffolding that eventually needs to be removed so you can shine, but you can’t give everything away. We all need our secrets. We need that little part of us to keep inside our heads that makes us, well, ourselves. Remember that, remember your core, what defines you, it isn’t anything that external, and it is hard to explain, but don’t lose it. That being said… here’s a bunch of cover songs for you! Yay! And yeah, two Operation Ivy covers, so what, they’re both good, deal with it. Summer is literally right around the corner! Woo! Let’s hear it for warm weather! 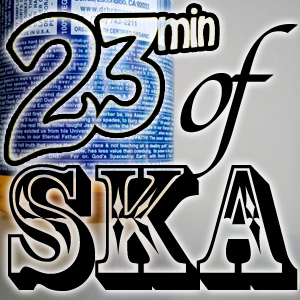 Let’s hear it for ska music! Let’s hear some ska music, that’s why we’re here, right? Well then, let’s get started and dig right in to some great music. Great music plus Summer, it is the greatest match ever! Jamaican Oldies Weekend is this weekend in Chicago, buy a pre-sale ticket now before you get down to all this awesomeness! Eric “Monty” Morris w/ Soul Radics and Roy & Yvonne w/ the Prizefighters, what isn’t there to love? Here we go! 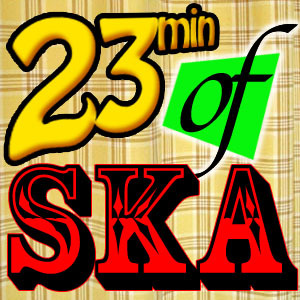 Another week of great ska music! Old & new, from near and far, by friends and strangers, it’s all good stuff. 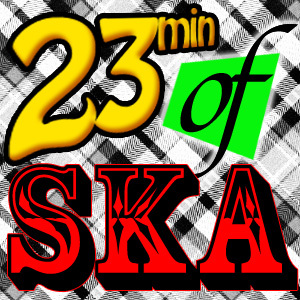 This is the 111th episode of 23min of Ska all together, sure, I count the specials, bonuses, guest episodes and interviews differently, but that’s still 111 23 minute chunks of ska out in the world! 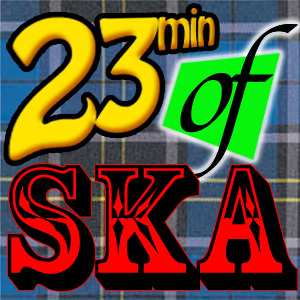 Technically this is episode 73 of the regular standard 23min of Ska show, and that still BLOWS MY MIND! A little idea back in December of 2009 that started on Jan 23rd of 2010 has grown a lot! Thanks for sticking around, seriously! Enjoy the music! LA Weekly has a great write up about the Delirians and the resurgence of ska in Los Angeles. Sonic Boom Six’s new single “Keep On Believing” is now available if you’re in the UK. Jump Up Records has a sale going on where you can get 7 LPs for only $35 while supplies last. Tomorrow is Download Day at Community Records feat. Stuck Lucky and other bands. The Amphetameanies put out a new video for their song Nothings OK.
Last year No Such Noise released their EP on vinyl, get it while you can! Ska/punk band After the Fact is offering the deluxe version of their “Super Scary Senarioes” EP at a cost of what ever the heck you wanna pay them for it. Hit up the Pragmatics, they just shared a few new songs on their ReverbNation page. Spend the rest of this month tracking down Kill Lincoln as they cross the snow to rock you. Sonic Boom Six look to be all over the UK & Ireland for the rest of the month. Dave Wakeling’s version of the (English) Beat are still running around America for the next three months. March looks like a busy month in the Midwest for the Pinstripes. Five Iron Frenzy just announced some tour dates starting in late March. Big D just dropped a handful of North East & Canadian tour dates in March & April. The Resignators are running all around their native Australia in April. Sammy K & the East Los Three are even closer to their goal, this album is going to be a ripper, check it out. Blame Sydney is so close to their goal, check it out, will you? Urban Pirate Records wants to get out a 5 piece 7″ set w/ a whole mess of great ska bands, it’s at 50%, let’s push it over the line.